It’s hard to believe it is 10 years since I reported from a tasting with Pewsey Vale’s winemaker Louisa Rose, which featured a fascinating tasting of Pewsey Vale Rieslings back to 1971. Now, courtesy of a tasting organised during the London Wine Fair 2010, I can report from a second and similarly engrossing tasting of Pewsey Vale Riesling all the way back to 1967 (and with a re-taste of that 1971) but also on the Rieslings from Jim Barry, with examples spanning 2009 back to 1989. The ageing pattern of these wines was clear to see. In their youth they display a primary, pure lime fruitiness, moving into a middle-age where waxiness and toast develops, into a full maturity where fruit has faded but a huge, coffee-bean roast character and bright acidity remains. The price of these wines remains relatively modest, for some of the world’s most intense and expressive white wines, with the capacity to age for several decades. All Clare and Eden Valley Rieslings have been under screwcap for the best part of 20 years now, but some of the older examples here were under cork. Wonderfully slatey, flinty nose with a rich, dry waxiness and lemon zest notes. The palate has lovely mid weight and nutty, lightly oily texture. The palate is bone dry, with a confit lemon character and pithy, lemon rind quality. Very long and delicious. 93/100. See all stockists of The Contours on wine-searcher.com. Fabulous, generous nose, the hot buttered toast and coffee quality. Rich, full fruit too with touches of nectarine over citrus fruit. The palate has delicious lime marmalade notes and more toast against the delightful freshness. 92/100. 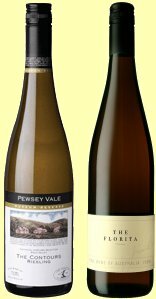 See all stockists of Pewsey Vale Riesling on wine-searcher.com. Ripe, very youthful character with clean, fresh pear and pear drop character. Some lemon and lime edge too. The palate has real intensity and bone dry presence. There’s a lemon juice blast on the palate, with dry extract weight and pithy grapefruit acidity. 92/100. See all stockists of The Florita on wine-searcher.com. Some waxy, almost Paraffin aromas of minerality. But quite fresh lime zest notes too. Fresh, dry, very zesty palate with lots of freshness and zest. Delicious, but not showing the complexity of the 1999 at this stage. 91/100. See all stockists of The Lodge Hill on wine-searcher.com. Very gentle nose, little touches of herbs and nuts. The palate has a smooth, very concentrated character with waxy, fat mineral and grapefruit zest fruit and drying, pithy acidity. 91/100.